Optifoam Foam Dressings: Optifoam'S Waterproof, Polyurethane Backing Helps Maintain An Optimally Moist Wound Environment, Helps Prevent Strike-Through, And Aids In The Prevention Of Bacterial Contamination Of The Wound. Backing'S Moisture Vapor Transmission Rate Adjusts Depending On The Fluid Level In The Wound. Foam Pad Has Micropores For Low Adherence To Wound Surface, Yet Has A Higher Fluid-Handling Capacity Than Other Brands. Foam Island Gently Expands As It Absorbs, Keeping The Dressing In Contact With The Wound Surface For Improved Fluid Handling. 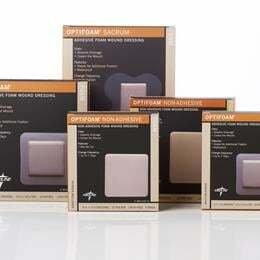 Optifoam Adhesive 4" X 4" With 2.5" X 2.5" Pad.